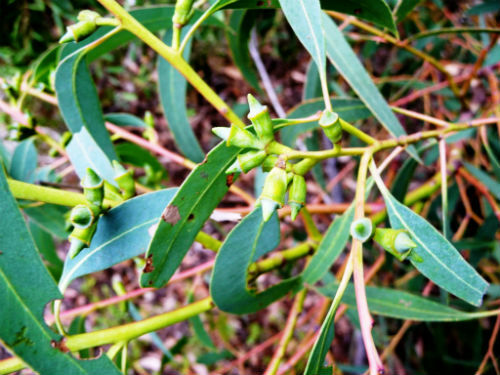 Eucalyptus baeuerlenii, Baeuerlen’s Gum, is a small to medium tree. In the wild plants usually have multiple trunks (mallee growth habit) due to the influence of bushfires. In cultivation plants usually restrict themselves to a single trunk. Bark is smooth, green, cream and brown. Buds are in groups of three and have a prominent beak. Flowers are 1.5 centimetres across and white. They appear in February and March. Fruits are bell-shaped. E. baeuerlenii is small enough to live in an average-sized backyard. Baeuerlen’s Gum is rare and found in two widely separated locations. One population is found near Wentworth falls in the upper Blue Mountains, NSW. The other is hundreds of kilometres south near Braidwood, also in NSW. Between these two populations there are huge areas of wild, botanically unexplored, mountainous country. Possibly other populations may be present in this country. The species is named after William Baeuerlen, a 19th century plant collector in NSW. The type was collected, by Baeuerlen, inland from Ulladulla, southern NSW and named by Baron von Mueller in 1890.